The State of Illinois may not be top of mind when it comes to wind energy, but Horizon Wind Energy has started phase two of a $600 million, 396 MW project on a site in the central part of the state which-with its gentle swells and broad valleys-is proving ideal for wind energy development. Chicago may be well known as the Windy City, but the State of Illinois itself is not exactly top of mind when it comes to wind energy. Much of the state has been seen-until recent years-as having mediocre potential for wind energy. That has changed, however-a study conducted by the U.S. Department of Energy (DOE) and the National Renewable Energy Laboratory (NREL) has identified several areas in the state as commercially viable wind sites. Texas-based Horizon Wind Energy has been one of the pioneers at large-scale wind energy in the state, and earlier this year wrapped up construction on phase one of the Twin Groves Wind Farm, a $600 million, 396 MW project in central Illinois. The 120 turbines of phase one, commercial by mid-May, now dot McLean County. When completed, the project will have a total of 240 wind turbines, each rated at 1.65 MW. The Twin Groves site is located in one of the areas identified by the D0E and NREL. The site is a good fit for wind farm development with a strong wind resource, excellent access to electricity transmission lines, good proximity to power markets, and wide-open cropland, according to the company. Bob Crowell, development director for Horizon Wind Energy, comments that most people tend to think of Illinois as being very flat. 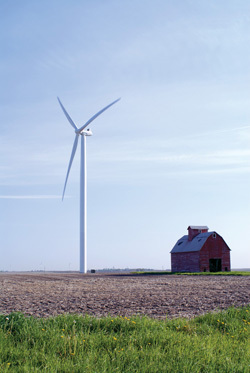 "Illinois is not generally thought of as a hotbed for wind energy," he notes. But in reality, the state has many gentle swells and broad valleys-ideal for wind energy development. These subtle ridges, hills and long uphill slopes are easily overlooked when traveling through the state. terrain features, and basically what it comes down to is how good the wind is on a particular site, regardless of whether you have high ground or low ground," explains Crowell. "It's really all about the wind." At this point, Horizon has been measuring wind velocity on the site for several years, and the results have confirmed expectations: the site is a wind winner. "It may not have the wind speeds that you would get in Oklahoma, Kansas and parts of Iowa, but it's a very commercially viable wind site," says Crowell. The site also offers the advantages of being near existing power infrastructure-Twin Groves is connecting to the grid with a 345 kV line owned by Commonwealth Edison. The 120 turbines of phase one of the Twin Groves Wind Farm are now commercial and will soon be joined by the additional 120 turbines of phase two. 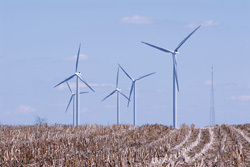 Support for wind energy, and alternative energy in general, has grown in Illinois while Horizon went through the permitting and approvals process for Twin Groves over the last several years. Illinois Governor Rod Blagojevich has called for more of the state's electricity to come from wind and other renewable sources. Last August, Blagojevich announced a broad energy plan which, among a number of energy initiatives, includes supplying 10 percent of the state's electricity from renewable energy resources by 2015. This Renewable Portfolio Standard (RPS) is voluntary, but there are currently efforts underway in the Illinois State Legislature to make the RPS mandatory. As an aside, there's a fair bit to be worked out on the electricity supply side in general in Illinois, as the utilities in the state are coming off a 10-year rate freeze. Some of the utility companies have come out in favor of using more wind energy, but have to be mindful about the effect this could have on energy pricing. "There's certainly activity and interest from customers looking to buy power generated from wind," adds Crowell. If, as expected, the interest in wind energy is sustained, further Illinois projects face an approval process that is demanding, but not overly onerous. Crowell notes that Illinois does not have a state siting board for independent power producers; the review for the Twin Groves project was at the county level. "It made it simpler, but with the states that do have siting boards, they usually have processes that are well established. "It comes down to how you work with the regulatory officials, and keeping them-and the community at large-informed about what is going on. There is a balance, though, in informing people and not attracting your competitors to an area when you are first trying to establish landowner interest. You need to provide information on a timely basis, as best you can. "In our case, we have a very supportive community base for the Twin Groves project." The company had an onsite development manager, Bill Whitlock, who oversaw keeping the community and relevant stakeholders informed about the project, all the way through. Crowell notes Horizon Wind has essentially been working on the project for the past five years, when you include all the planning time. "We first identified the site in late 2001, and started meeting with landowners around that time, and signing them up for land leases." 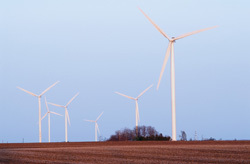 The company had done its homework and believed the Bloomington Moraine was a good site for wind energy. The Department of Energy study came out shortly after, confirming that conclusion. "We think we are on one of the better sites in the state for wind energy." Construction on phase one started last July, with completion in April, and construction of phase two is set for completion in December. Construction on the first phase was delayed slightly by heavy rains last summer. And, ironically, the company had a few delays with the cranes erecting towers due to high winds. "We like having good wind on the site, but at times it made it a bit difficult to carry out construction," says Crowell. "Generally, construction on phase one was pretty straightforward-the rain, the wind, and having a couple of below-zero days were probably the most difficult parts of the project." Getting and organizing all the components for a 120-turbine wind project posed its own challenges, but that was to be expected. Aside from that, construction went as planned. At this point, Horizon has done a large number of wind farms, and pretty much has the process nailed down. The company was understandably interested in siting the turbines to get maximum wind. Crowell notes that there was not a clearly defined ridgeline, which gave them a certain degree of flexibility in locating the turbines. "One thing about central Illinois, though, is that is has a very distinct grid pattern of roads, with a road every mile going north-south and east-west. So we needed to have setbacks from the roads, as well as property lines if a landowner chose not to be a host, and homes." One county enacted a zoning ordinance stipulating that the turbines have a minimum setback of 1,000 feet from homes. "That did not really hamper us," explains Crowell. "I think we are perhaps different from some of the other wind energy developers in that we try to have a 1,500-foot setback from residences in the Midwest." Horizon is also making efforts to minimize the land used by the turbines, and hence removed from crop production. "We need to have roads to get to the turbines, and then there is the footprint of the turbine itself. But the farmers are able to continue to farm right up to the roads and near the base of the turbines. "Even though we are spread out over a 21,000-acre area, we're probably only taking out-at most-200 acres from permanent crop production." Turbines are spaced at specific distances to ensure they comply with the manufacturer's warranties. "That causes you to spread things out a little bit, as well." Logistically, the company felt it was prudent to space out the timing of the Twin Groves Wind Farm construction into two phases, of 120 turbines each. Doing 120 turbines is a lot in one construction cycle, Crowell says. There were other factors, such as turbine supply, and simply making the decision to diversify the company's resources across several wind energy projects. Horizon also has wind farm projects under construction in Minnesota, Oregon and Texas. A general contractor, M.A. Mortensen, was hired and Horizon's construction director William Kelsey worked closely with the Mortensen people. The turbines on the project were supplied by Vestas and GE-Prolec supplied the transformers. Greycor built the six-mile line to the 345 Kv main line, the interconnection station and the step-up substation for the project. Heinkels & McCoy did the underground collection system. Horizon has an established process for moving from a construction phase on a project to an operational phase, as was the case with phase one of Twin Groves. "Our typical operations model is we hire the turbine manufacturer to do the heavy operations and maintenance during the warranty period, and we have an on-site manager to oversee the operation." The company has its own people getting ready for several months prior to completion-they are involved early on to make sure the transition is smooth. The sense of achievement for a job well done for completing phase one was short lived, says Crowell. "It's rewarding to see something that was started five years ago now being real iron in the ground, and providing power-but then we know we've got to get things going with the next phase." Horizon Wind has further plans for Illinois, beyond phase two of Twin Groves. The company is currently in the development phase for Blackstone Wind Farm, slightly to the north. The anticipated construction start for Blackstone is spring 2008. The project's size would be between 300 and 600 MW with between 100 and 200 2.1 to 3 MW turbines. Total project cost would be between $375 million and $750 million. There seems to be some wind power momentum in Illinois right now, says Crowell, with many of the elements for development-support for RPS, the strength of the existing grid, the interest of landowners and availability of suitable sites-being present. "All those things play into it," he says. Currently, most of the electricity in Illinois-which is fourth in the nation in terms of generating capacity-is generated by coal and nuclear (over 90 percent), with some natural gas-fired power plants. "Penetration of wind power in Illinois is growing, but it's small right now," says Crowell. "Illinois has been by and large a coal and nuclear power state for a long time." But with the Department of Energy studies identifying wind power sites in what had been thought of as a wind power-barren state, the potential is now there. "Wind power is not the only solution, but it's part of the solution," says Crowell. "It makes sense and the more the utilities have experience with wind power, the more they like it as part of the power generation mix." Illinois and the Midwest are especially suited for wind power, he adds. "There is so much open crop land, you're working in a well-established agricultural area, and it's well suited from a wildlife interaction standpoint." In the case of Twin Groves, the company had Curry and Kerlinger, LLC, and WEST Inc., well-known consultants to the wind industry that specialize in bird and wildlife issues, conduct avian risk assessments to determine the presence of birds and other wildlife at the site. The consultants' reports indicated that the site is not populated with threatened or endangered species and is not likely to present a significant impact to birds. The human-rather than animal-element can sometimes be the challenge to deal with related to wind farms, says Crowell. "Sometimes the greatest thing the industry has to overcome is people's perceptions of wind farms-it's the fear of the unknown. But as more wind farms are completed, and people see them, they realize they don't create problems." In fact, if you're looking at reducing the country's need for imported oil from unstable parts of the world, alternative energy projects, such as wind farms, are viewed by many people as a key part of the solution.